Brazil is calling! The whole world is full of pleasant anticipation of the upcoming Football World Cup in June. 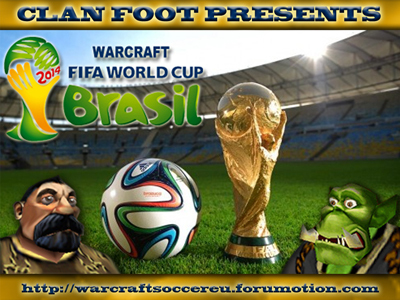 In many places the preparations are in full swing – even across the internet community of Warcraft 3 Soccer. Because since the beginning of May, Clan FOOT plans to reciprocate this worldwide event to the online gaming communion. After the released Warcraft-3-Map „FIFA 2010 World Cup“ the creator and mapmaker Dafling (aka morganxl) is working on a new version for this years tournament in Brazil. „It's cool to do some mapmaking again - especially when people are suggesting lots of features. So I'm glad to be contributing again“, said Dafling. The communities suggestions amidst the prosperous World Cup theme seemed to get him excited about his new task. The idea was initiated by Clan FOOT Chieftain ‚Gado1‘. Whom thought the upcoming international event worthy of its own specific version, remembering the map version from 2010 he was of the opinion that the World Cup map should be a tradition that must be maintained. „The aim is two things“, said Gado: „Firstly, to bring something new to everyone who are currently into this game and make them feel like they are experiencing the World Cup through the game. Secondly, I hope this will attract new players to this game and be a reason for them to continue playing“, explained the Swede. Gado further clarified the World Cup to be a very emotional experience and very important for everyone around the world, no matter of your culture or race. That's why he also sees big potential in acquiring new players. „People tend to seek out anything related to the World cup at this time and if we have a version related to the World Cup, it could bring them to us“, hopes the Chief. For him this is also a way to experience less stagnancy in the future. „It's a game I love and if it can only improve and bring more people together, I would give anything to make it happen“, as Gado expresses his dedication to expanding the community. Dafling looks at it in a similar way: „I'd like soccer community to be vibrant. So that every evening you come online, there's always something fresh to do - interview with an old player to read, a new video or replay to watch, a feature to be coded, etc... I feel kinda responsible for this aim, because no map development means no community development“, said the Russian mapmaker, while he hopes that one day Warcraft Soccer will take over Dota as the most popular map in Warcraft 3. In order to achieve these particular aims, Dafling is currently in the process of creating a new version to attract interest to the game. After brainstorming ideas, the community agreed upon the most important and necessary features to be implemented in the new version. The atmosphere of the World Cup shall be transformed into the game. „Not only should you be able to pick your nation at the start, but also hear the cheers of the stadium when goal is scored, maybe listen music in the background, perhaps add some spectators around the pitch“, stated Dafling. Most of the work is already done according to Dafling, with the new map containing an individual loading screen and preview picture which were designed and contributed by ShineXXX. Another great feature will be jerseys on the players accordant to the chosen national team at the start of the game. The old mapmaker-comrade Vladimir has already declared himself willing to help due to his modeling skills. The world can be looking forward to a great competition that will also take place in Warcraft 3. Gado has experienced unfortunate circumstances in that his nation Sweden around their superstar Zlatan Ibrahimovic haven‘t managed to qualify for the World Cup. But therefore he will probably find more time to play the Warcraft FIFA World Cup 2014. The waiting finally has an end. 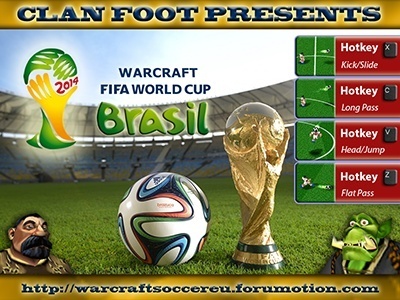 The World Cup 2014 already is in full swing, and punctual to the start of the tournament Dafling published the official "Warcraft Fifa World Cup 2014" on the 12th of june. The map already enjoys huge popularity in the community. "I couldnt barely await it that the map finally came out. I already was as hot as chip fat! But it was worth waiting. The map became simply amazing! ", said the visibly sunshiny ShineXXX and added: "To all football fans out there: i highly recommend you to play this game! It will blow your mind!" Clan FOOT has won the "ENT Mini World CUp Tournament" (3vs3). In a heart-stopping finish the team "Toast Of Truth" (ShineXXX, bread, wzm, Xatenev) triumphed against "Supa-A-Stars" (Black-Knight[2, Ronaldo, Heinkel) with the score of 4:3 after golden goal. "It was a legendary final. This game really was advertising for warcraft soccer. It was so damn exciting and even it would have given you heart attacks. It's unbelievable we won that final. What a great match", said the overhappy Teamcaptain ShineXXX after the game. Thanks to the victory of the tournament the soccer community has earned 30 Dollars - money which will be directly invested into warcraft soccer.